What is a 'service lift'? These lifts go by various names including dumbwaiter, kitchen lifts, catering lifts, service lifts, trolley lifts, roll cage lifts and our favourite... the microlift! When we say service lift we're referring to a lift that helps you move goods around your workplace or home that are too dangerous or cumbersome to lift manually, carry up multiple flights of stairs or a change in level. These are small goods lifts that can be loaded at waist-height or floor level and do not care people. What are service lifts used for? A service lift can range from a dumbwaiter or 'microlift' in a home to move groceries, crockery etc. They also operate as catering lifts or kitchen lifts for a restaurant that has one or more floors - aiding in the serving and clearing of meals. Or for floor-level service a trolleylift that moves roll cages in a supermarket, delivers catering trolleys, or helps move boxes, kegs and crates between floors. How do I know whether I need a service lift? If you are repeatedly moving goods over two or more floors by hand then a service lift will improve efficiency and safety. If you are a business owner you're legally responsible for the welfare of your staff during their working hours and also for the health and safety of everyone on your site. You can read more about how to assess your workplace and see how helpful a lift could be to you in our blog on Manual Handling Regulations. Can I install a dumbwaiter in a private dwelling? You certainly can. We have installed many Microlifts, or dumbwaiters, in town houses where carrying goods such as shopping, over several stairways is challenging. Historically most grand houses had a dumbwaiter from kitchen to dining room. We've even seen a lift to a bedroom that delivers pizza from the restaurant downstairs! Where does the term dumbwaiter come from? The term 'dumb waiter' came to be as the lift was first used in large houses that had their kitchens and household staff in the basements or the ‘servants quarters’. These servants would use the lift to take food and dishes upstairs to the dining room and back down again as the go-between from kitchen to restaurant, allowing noise and cooking odour to be isolated from the patrons. The origins of the term are simply that this lift was a way of having your own silent waiter, not seen and not heard. Service lifts can cost from £6,000 upwards, however they vary depending on travel, configuration, number of floors and options. It's also important to consider what building work will be required and how that will add to project costs. How do I take goods in and out of the lift? If you have a small service lift or dumbwaiter, working as a catering lift, then you will usually have this installed at waist height for loading/unloading plates and cutlery. Larger service lifts such as a Trolleylift will be loaded at floor height and take the goods to another floor level, so your goods would be on a trolley or a pallet. I run a business where we serve meals. Is there a way to keep the food hot? Yes, at Stannah we offer a heater in our Microlifts. There are two options, the first is to go for an infrared heated lift car, the second an option to have some or all of the shelves heated. A lot of the time customers typically have two lifts, one for service and one for clearing, either side by side or stacked (double decker arrangement of two lift cars using one shaft). How far can a service lift travel and how much can it carry? Our dumb waiters can travel up to 30 metres or 12 stops and carries up to two standard loads - 50kg or 100kg. If you require a larger lift, our Trolleylift can travel up to 18m with up to 6 stops and carry loads of up to 300kg. We're also able to supply bespoke options too. What configurations and sizes are available? Yes, most configurations are possible. Single is the same entry side on each floor, after that there's through and adjacent entry lifts available. You can even have two entrances on the same floor if required. These little lifts are some of the most compact forms of lift so you'd be surprised at how small a space is required. There are also service lifts that are specifically designed to overcome low headroom on the upper floor. Whats the average load of a dumbwaiter? 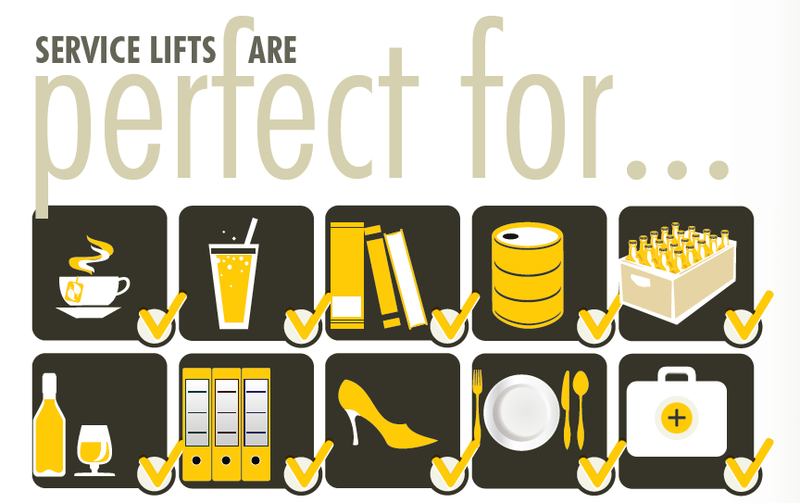 The average loads are 360 per day for a Microlift and 180 per day for a Trolleylift. Can these lifts withstand being used all day? Service lifts are workhorses, built to last and to be well used. Our longest serving Microlift on our service records is over 39 years old and still going strong! Like a car the key to the longevity is proper care and regular maintenance with a lift service provider. There are all sorts of options for conveniently fitting a service lift into your new or already existing building. A goods lift provider, such as Stannah, can visit your premises and carry out a survey to advise you of the best position and product for your needs and walk you through the process. How long does it take to install a service lift? We supply most of our Stannah service lifts from our warehouses in the UK, meaning we can supply and install them in just a few days, subject to builder’s work. We always do our best to minimise interruption time to your business, working on weekends and evenings to minimise disruption. Which type of service lift do I need? If you're not sure what type of lift and the differences between them then take a look at our Service Lifts Infographic for more information. If your commercial premises, school, kitchen, restaurant or shop has two or more catering/serving floors, then you'll likely require some sort of service lift. Here at Stannah we offer a broad range of goods and service lifts so can advise on the best product to suit your needs, you can see more on our product ranges. Alternatively, if you have a question that isn't covered here then please do get in touch and we'll be happy to help!